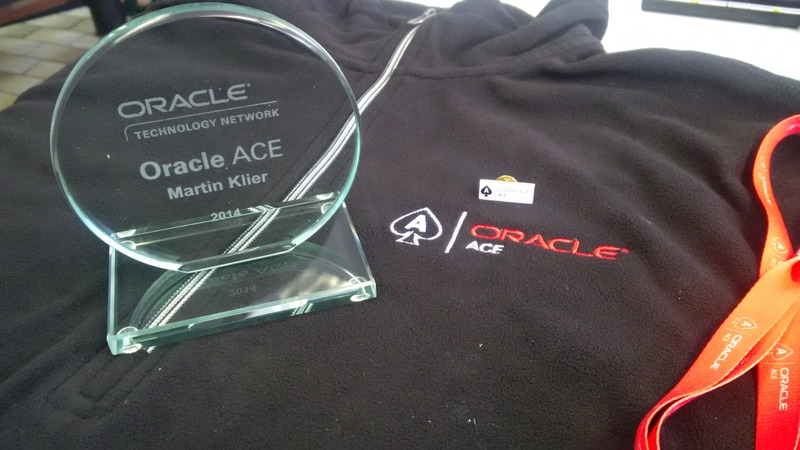 I feel VERY proud, honoured and grateful, that Oracle awarded me with the Oracle ACE in December 2014. The Oracle ACE program is a community reward, and encourages us to participate, enrich, promote and organise Oracle community events. When speaking about the community, first of all I’d like to highlight my Oracle User Group of Germany, the DOAG (Deutsche Oracle Anwendergruppe). They are doing lots of nice, and educational things, lifting the fog, and practicing free and self-assured community work. Helping to spread this in our region, at conferences and events, is a pleasure. I’m very proud to be part of this great team. A little less, due to the geographical distance, but with very similar motivation and experience, I feel connected and involved with the U.S. pendant IOUG (Independent Oracle Users Group). They are open for the international crowd, and it simply feels good to be there. And I want to say thank you to three people, for all they do, think and say about me. These very special folks are Björn, Craig and Dietmar. I’m proud to call you friends. 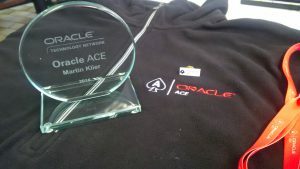 My Oracle ACE program shipment just arrived today. Just in case somebody cares, here’s my Oracle ACE profile. I hope to keep up the level, and will continuously try hard to find the time to give back knowledge to the community. 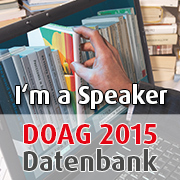 The DOAG 2015 Database conference is on the horizon: June 16, 2015 in Düsseldorf, Germany. 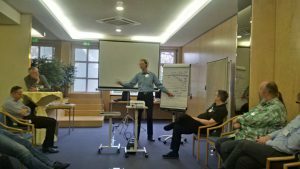 Der Vortrag richtet sich an Einsteiger oder IT-Fachkräfte die nicht in Vollzeit als DBA arbeiten, jedoch Interesse an Datenbanktechnologie haben, bzw. für Entscheidungen hinsichtlich eingesetzter Technologien, Features und Lizenzen Anhaltspunkte suchen. 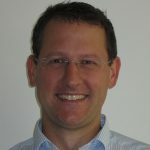 Der InMemory Column Store ist eine relativ neue Struktur der Oracle Datenbank 12c, und wird vom Hersteller massiv beworben. Der Vortrag möchte zeigen, wie diese sogenannte “In-memory Datenbank” konzipiert ist, funktioniert, und in welchen Szenarien sie sinnvoll eingesetzt werden kann. It was time to try something new in our DOAG Database Community. And please, please just not another frontal conference: twenty guys look forward, one looks back, like eight-oars-and-coxswain. I don’t know if DOAG invented it, but it was a success: The Noon2Noon Event. How does it work? It’s like 24 hours of BarCamp, starting with a lunch, having a topic-of-the-day, lasting overnight, with winter barbecue, compatible for elders (thus, with Hotel and beds, no after-midnight hacking :) ). Ah, forgot to mention: One single talk being completely away from the topic, but somehow related to our work. From the technological aspect, it was great to learn something about MySQL – how consistent reads, clustering, and lots of other stuff works, that we never ever thought that it could be done different from the way the Oracle Database works. And that MyISAM isn’t the norm, but just another PITA. :) Go for InnoDB. What is MariaDB? And what the fork is Percona Server?